Alpine Spirit Coaches, based in Myrtleford/Bright, conducted a bus safety training session during early winter in preparation for the snow season. 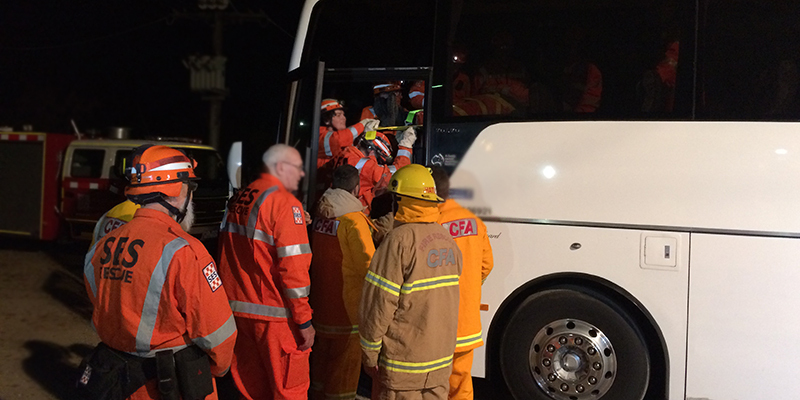 Around 50 local SES and CFA emergency services attended the event, along with Bus Safety Victoria. Emergency service crews took the opportunity to conduct a mock emergency evacuation of an injured passenger. The primary focus was for first responders to familiarise themselves with the various bus specifications and setups that operate on Mt Hotham and Dinner Plain and discuss specific safety risks associated with operating in alpine hazardous areas. “The recent training night was in response to last year’s incident where our coaches froze on Mt Hotham and we were stuck in a snow blizzard,” said Alpine Spirit Coaches co-owner Chris Bonacci. “It is great to see bus operators proactively managing the specific risks associated with their bus services. A proactive ‘learning culture’ is where bus operators learn from incidents and near misses to continually improve safety outcomes,” said Shaun Rodenburg, Director Bus Safety at Bus Safety Victoria.